Canadian Motivel Inc is a fully authorized 3M Abrasive and Scotch Brite distributor well versed in problem solving for countless grinding, sanding and surface conditioning applications. We are prepared to offer demonstrations and advice on both metalworking or woodworking operations. Find below some areas of interest and contact us at your convenience for any further assistance you may require. 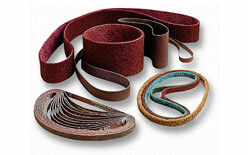 Canadian Motivel Inc. provides coated abrasive belts for use in sanding, grinding, deburring, blending, finishing and polishing applications. The combination of several minerals, resin systems and backings results in a wide variety of products to meet requirements for use on most wood or metal surfaces. Used for a wide range of applications including decorative finishing, grindline conditioning, and blending on a variety of metals. Tough reinforced nylon and abrasive belts allow controlled cut to eliminate gouging, run cool and leave burr free finishes. Canadian Motivel Inc. proudly distributes surface conditioning belts in a wide variety of widths to meet your specific needs. These hand pads are designed to offer the user a flexible and conformable abrasive for general purpose cleaning, blending, prep work, and finishing without damaging the work piece. 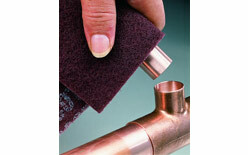 Feel free to contact Canadian Motivel Inc. to see the availability of Scotch Brite hand pads. 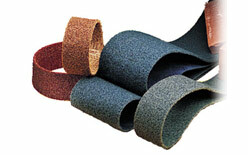 Scotch Brite hand pads are available in a variety of webs, grades and sizes.